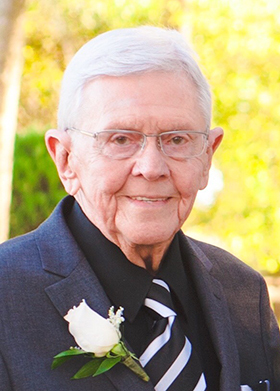 George Andrew Toups, Jr., 87, of Nederland, died Monday, February 11, 2019. He was born on September 8, 1931, in Beaumont, to Margaret Gist and George Andrew Toups, Sr.
George was a United States Air Force veteran, having served in Korea. He graduated from St. Anthony High School and later graduated with a bachelor’s degree in business from Lamar University. For twenty-five years he worked for Rogers Enterprise / TSO Labs. He retired as the owner and operator of Meineke Car Care in Nederland. Survivors include his wife, Iva Toups of Nederland; sons, Mitchell Toups and his wife, Tonya, of Beaumont; George Andrew Toups III of Houston; and Steven Toups and his wife, Dette, of Beaumont; daughters, Suzanne Toups of Beaumont and Janet Toups of Brooklyn, New York; step-daughters, Deena Wilson and her husband, Chuck, of Nederland and Angie Guidry and her husband, Jeff, of Nederland; grandchildren, Marlee Freeman and her husband, Devon; Savana Guidry; Peyton Toups; Christopher Nolan; Charles Bradford; Connor Toups; Griffin Toups; Anderson Toups; Phoebe Toups; April Wilson; Taylor Toups; and Reese Toups; three great-grandchildren, and numerous nieces, nephews, and extended family. He was preceded in death by his parents; daughter, Wendy Toups; brother, John Toups; sister, Mary Belle Wearden; and the mother of his children, Margaret “Peggy” Toups. Memorial contributions for Mr. Toups may be made to an organization of one’s choice. A gathering of Mr. Toups family and friends will be from 4:00 p.m. until 7:00 p.m., Tuesday, February 12, 2019, at Broussard’s, 505 North 12th Street, Nederland. A graveside service will be held 10 a.m., Wednesday, February 13, 2019, at Oak Bluff Memorial Park, 101 Block Street, Port Neches. George and I went through all grades at St Anthony. Where we played Basketball, Baseball and Football. We were also neighbors and was friends with family. He was a good friend and will be missed by many. May His Soul Rest In Peace.